(which reminds me in turn of Richard Feynman’s older book of letters, Perfectly Reasonable Deviations, compiled by his daughter, that, despite much mundane content, I think lends a better overall sense of Feynman the person than his more embellished autobiographical work, which often gets criticized). As a counterweight to Taleb ;) I may read Richard Thaler’s older volume, Nudge too. Closing the Gap (on prime numbers) from Vicky Neale has gotten good reviews and looks enticing. Sabine Hossenfelder’s upcoming Lost In Math is more physics than math, but certainly of interest. Recently received a review copy of Weird Math by David Darling and Agnijo Banerjee, having heard nothing about it beforehand, but just leafing through it, looks possibly interesting also. In short, so many books, so little time…. It naturally generated LOTS of widely-varied, interesting choices, perhaps worth a look. Anyway, a sort of fun exercise to think about. "[James Dilts] works as a mild-mannered mathematician by day and as… well… a mild-mannered mathematician by night. The Missus disputes the mild-mannered part. Despite the best efforts of his middle and high school teachers, he discovered that math is awesome, and has decided that everyone else needs to know this too. His academic research is some combination of general relativity, differential equations and differential geometry, which he promises is super cool. He has an Erdös number of three." 1) Tell us a little about your background that led to a major in mathematics. 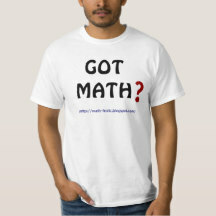 Honestly, I have no idea how I ended up as a math major. My family growing up was more science-y than most. (My 3 older brothers are all programmers, for instance.) But, I didn't have any particular role models at all. I didn't know a single professor. 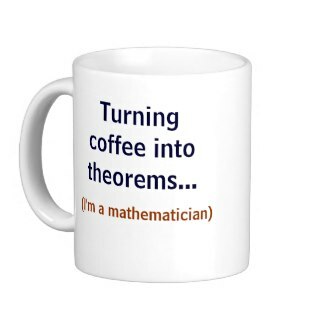 I'm not even sure how I learned that "mathematician" was a valid job! But, sometime in high school, I decided I wanted to do research, and figured that I'd try math first, and if that didn't work, switch to physics or chemistry. I went to Brigham Young University for my undergraduate, and my first year there I took the intro to proofs class. I loved it! When we covered Cantor's diagonalization proof (available on our post "A bigger infinity"), I knew that I wasn't going to switch to physics. 2) Is there any particular backstory to the name of your blog, “Infinity Plus 1”? When I decided to start writing the blog, we of course wanted a name that was light-hearted and memorable. And every kid has, at some point, tried to pull out "infinity plus one" to win an argument, so it seemed like a good fit. It also was a great segue into our first posts, where I wanted to talk about Cantor's diagonalization proof, for obvious reasons. 3) Your posts always have a light-hearted feel to them, even when you’re dealing with difficult, abstract ideas. I get the feeling you have a lot of fun writing them. Do you have a couple of favorite posts that were especially fun or satisfying to write? And do you have any idea which posts have been most popular with readers? The most popular question is easy. Every time we've written a biography post (for Cantor, Schwarzschild, and Godel), they've always been more popular than the rest. The Godel post, in particular, got picked up by some service, and ended up with about as many views as the rest of the posts combined! 4) Who are some of your own favorite math/science writers (or, feel free to mention writers of any sort who have been important to you)? Honestly, I've gotten most of my information from class and textbooks and talking to professors, even the fun stories. But probably the most important science writer for me was Isaac Asimov. Most people who've heard of him know him for his science fiction, which I love. But he also had a PhD, and wrote a lot of science essays about all sorts of topics, from mathematics to physics to nuclear chemistry to why it's a tragedy we have a moon. Sure, none of the science is up to date anymore, but I'd still recommend his essays to anyone. His style was always light-hearted, and though I didn't think about it till now, I'm confident he heavily influenced my own writing. And is this an area that involves more strictly abstract or pure mathematics, or applied math as well? In normal, Newtonian gravity, initial data is arbitrary, which means that you can plop down planets wherever you want, and feel free to evolve them. Newtonian gravity won't break. But relativity is different. In general relativity, your initial state of the universe has to satisfy certain conditions, and those conditions are the Einstein constraint equations. Now, unlike some equations, there are a lot of solutions to the constraint equations. One goal is to try to understand all the possible solutions to the constraint equations. One way to approach that is to try to parameterize all of the solutions, which means that if you give me some inputs x, y, and z, then I can turn around and give you a unique solution. That turns out to be a difficult problem. My research has focused on trying to find ways to show that the equations do or do not have solutions for certain inputs. It's a pure mathematical question, but numerical techniques have been helpful. Relatively recently, we realized that no one really knew what the right thing to try to prove was, which makes it really hard to prove anything. It was a huge road block. So, we used some numerical techniques to figure out what was going on, which turns out to be much more complicated than anyone had thought. 6) I believe you’re currently job-hunting (coming off of a post-doc) and looking more into computer programming… say a little about what you’re most looking for in a new position or in the future? I want to continue to work on interesting problems. A lot of programming jobs are just making another app, or working on the company's website and backend. Those are important jobs, but not what I want to do. Programming can be a powerful tool for investigating difficult questions, as I saw in my research, and my ideal job would let me contribute to that. 7) Besides your blog, are there any social media or other websites where readers can particularly look for you? I'm actually anti-social media! I have a Facebook page and a Twitter for the blog, since many people want to receive them in that way, but I'm otherwise completely off of Facebook and Twitter and all the usual culprits. I'd much rather spend my time on more important things. 8) When you’re not doing mathy sorts of things, what are some of your favorite activities/hobbies/interests? I'm an avid rock climber and unicyclist. I also love reading, especially classic science fiction, and playing games of all sorts. Of course, a lot of my time is spent making sure the Epsilons [my kids] don't destroy the Missus! Hope too you find what you desire in a computer career, and hope your clear talents for writing and explaining continue as well in some form! If you've never read James' blog before, definitely check it out; you're in for a treat! …and on Sunday, right back here, I’ll have a new interview posted, so please do return for that. 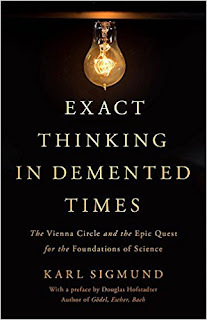 “Exact Thinking In Demented Times” is a wonderful title that sounds very apt for current times… but in fact it’s the title of a volume from mathematics professor Karl Sigmund recounting philosophy a century earlier in Europe. The subtitle is: “The Vienna Circle and the Epic Quest for the Foundations of Science.” For any who don’t know, the Vienna Circle was a group of philosophers and scientists who regularly discussed logical positivism and analytical philosophy underlying science (and stood largely in opposition to metaphysics). They included some of the dominant academics and intellectuals of their time. Like several books I’ve reviewed here over the years, this is more a volume at the fringes of mathematics, than about math itself or doing mathematics. I loved this volume, but one’s enjoyment will hinge on having some inherent interest in the philosophical thought and luminaries that dominated 20th century European philosophy. This is my first strong book recommendation of 2018, but worth noting it actually came out in the English version toward the end of 2017, and the original German version was even out in 2016. Renowned Douglas Hofstadter wrote the Preface for this edition, and he apparently had much to do with the German-to-English translation as well. I was mainly interested in this volume to read more specifically about the 1) ideas and 2) interactions/personalities of the members of the so-called “Vienna Circle.” The book fulfilled the second of those wishes, but less-so the first. Like other things I’ve read about the Vienna Circle, this volume skirts above the surface of the nitty-gritty philosophical arguments/ideas that resounded back in the day. It may simply be the case that getting down into the weeds of deep philosophical arguments would make for dry, boring reading and is thus voided. The narratives, personalities, and history are what make this a fascinating volume. The first four chapters (or ~100 pages) are essentially background to the Vienna Circle before the next two chapters really begin discussion about the Circle itself. The next couple chapters veer off again to some elements tangential to the Circle. The second half of the book (my favorite half) returns in large part to a focus on the interactions/clashes/personalities of the Circle members and associates. In total I suspect one third to one half of the volume is concerned with people or history outside the Circle (for example, there is a lot of material on Karl Popper, though he was never an actual member of the Vienna Circle itself). I more-or-less fathom the fame of Russell, Popper, Gödel, and Carnap, but not as clearly that of some of their contemporaries, and this work doesn’t make some of the other prominent names any more scrutable to me. In particular, I’ve never quite grasped what, beyond a blustery, assertive style, made Ludwig Wittgenstein such a towering figure in 20th century philosophy (interesting, yes, but why so dominating?) — and this volume doesn’t flesh that out any further for me (despite the many pages devoted to him). Still, overall, this is a highly enjoyable, rich read. Finally, I must offer an additional reason to read this historical account — it very much reminds one of the broader events of the world, principally Europe, in the 1930s (and how easily/quickly democratic institutions can be undone in troubled times), which eventually led the world to exclaim in unison, “NEVER again!” A reminder… which today… is very timely.